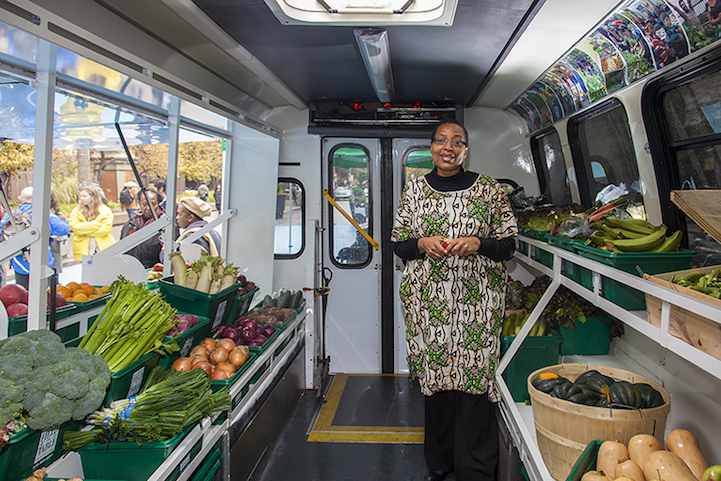 The Mobile Good Food Market is taking healthy food on the road and providing affordable and nutritious food options in communities that live in food deserts – neighborhoods with little local access to healthy food options. The bus was the brainchild of FoodShare Toronto which is an organization who works with neighborhoods and schools to provide healthy food options and education. They operate under the notion that “everyone deserves access to affordable high-quality fresh food”. 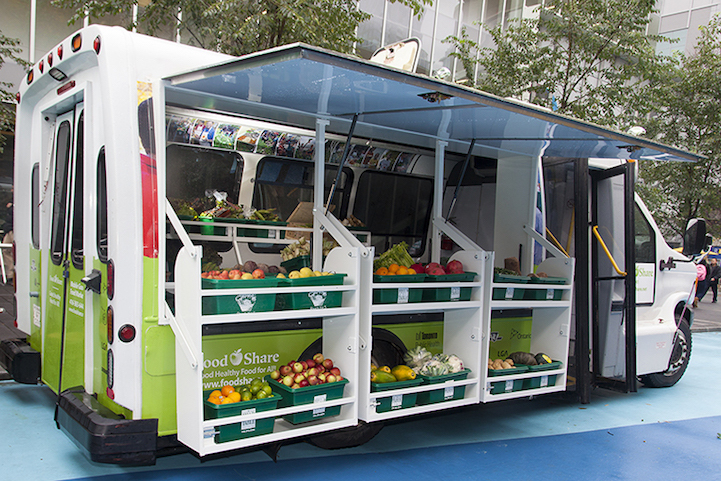 The bus was designed by LGA Architectural Partners and commissioned by FoodShare Toronto. The wheelchair accessible bus can be boarded to check out the goods and can also protect patrons in inclement weather. Currently, the bus travels to neighborhoods only two days a week but FoodShare Toronto is hoping to find funding to expand service and provide more opportunities for residents to take advantage of healthy, fresh foods. This program reminds me of Boston’s City Hall To Go truck which brings city hall services right to your front door. The mobile office travels to different neighborhoods and allows constituents to renew a residential parking permit, get something notarized, request a copy of a birth certificate and more. This service provides easy access to documents and services that may be difficult to obtain because of personal mobility, distance or other issues. It’s exciting to think about what others ways our cities, towns or even rural communities could be transformed through other kinds of mobile services. 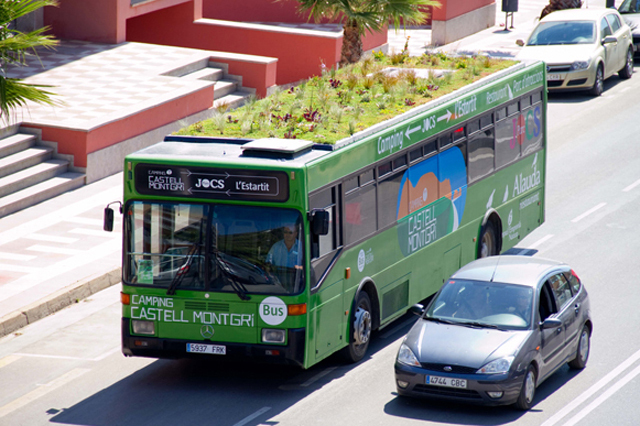 Designer Marc Granen decided to plant a garden on the roof of a bus. Yes, a bus. If you’re in Spain, you might be able to catch a glimpse of the Phyto Kinetic in action. Granen and his team of designers have designed a lightweight rooftop garden with a multitude of uses. Granen says that his mission “is to expand the garden area in urban environments, increase the absorption of CO2 and give public transport a new ecological and tourist attraction”. I appreciate Granen’s clever use of a space that we may not think of as underutilized and I think it would be exciting if these buses were able to help grow and deliver food to neighborhoods that have poor access to healthy food options. Maybe they could grow gardens on school buses and that food could feed the children! Some buses have bicycle racks but front racks add space when the bus is parked and areas that have limited space (i.e. Manhattan) cannot afford the extra room. Utilizing the top of the bus, could provide a resource and not have to take up additional space. 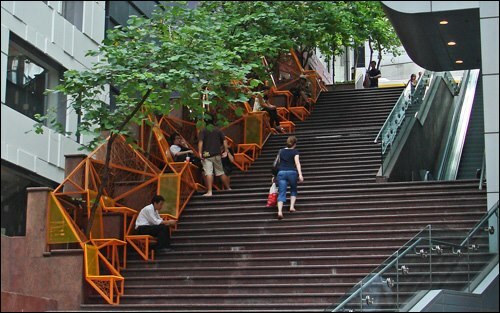 While this mini-park would not be accessible to those with disabilities or strollers, it is a creative and important use of space providing seating and refuge amid the density of Hong Kong. The design of this park takes full advantage of the shape of the stairs and in doing so, appears to provide solitary or communal seating options as well as the ability to transform some of the seats in to tables which could be used during coffee and lunch breaks or to play chess with friends or games with children. One of the best elements of this mini-park is the trees which not only provides shade but also a protective canopy to its users. Hong Kong’s stair park is similar to another imaginative project called Stair Squares. 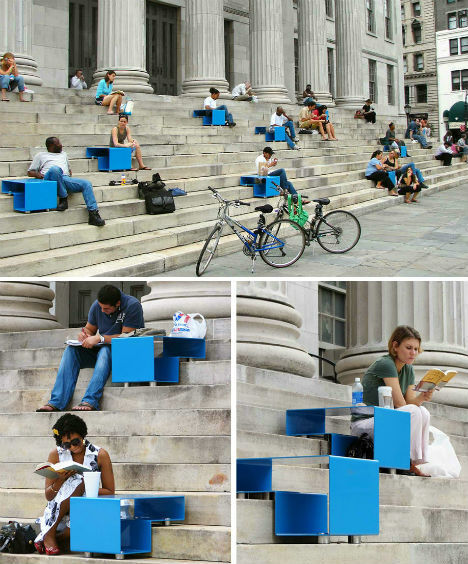 In 2007, artist Mark Reigelman created “squares” that were installed on the front steps of Brooklyn’s Borough Hall, helping to give the staircase a myriad of additional and more comfortable uses and turning it in to a more dynamic public space.